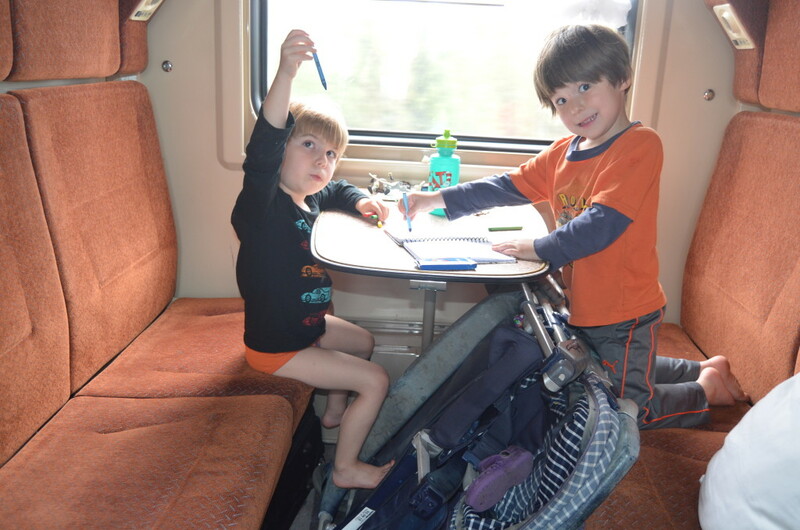 Helsinki, Finland – Regular readers will know that the twins are crazy about trains. We never met a kiddie train we didn’t ride. The time has come to test this love of riding the rails: what good is it unless we can actually go somewhere? So we decided to make the journey from Moscow to Helsinki by train–a 14 hour trip, departing at 11pm and arriving the following afternoon. Originally we thought that the twins could ride the train for free. Actually, they could ride the train for free, but only by sharing a place with an adult (like “lap babies” on the airplane). That would require Daddio and me to spend the night on narrow bunks with thrashing four-year-olds. It would also mean, likely, that the remaining two bunks would be occupied by two more full-grown adults, making for a very crowded train compartment. So we bought the twins their own tickets, meaning that our family had our own private little cabin. This was cozy indeed. And the twins were delighted. Once we were moving, Twin S snuggled right into his comfy bunk and was quickly lulled to sleep by the swaying of the train, just like the kids in one of our favorite bedtime books, The Goodnight Train, by June Sobel. Twin V was so delighted that he wanted to stay up all night playing with the toys he had packed in his backpack. It did not go over well when I insisted he put the toys away–and our entire train car heard about it–but it didn’t last too long. 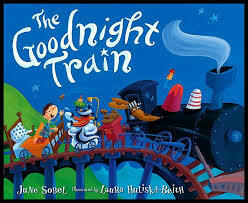 By midnight, everyone was riding The Goodnight Train. Normally I love sleeping on the train. I love the rattle of the rails and the movement of the cars. Daddio and I took the overnight train to St Petersburg last week, and we both agreed it was our best sleep since leaving our memory foam mattress. In the morning, we did not want the train to arrive because we wanted to keep sleeping. But on this trip, I was anxious. I was anxious that the twins would fall out of their narrow bunks. I was anxious about the transition to a new destination. I was anxious that we had stiffed the guy who helped us with our bags (even though earlier I had been proud of myself for refusing to pay his outlandish fee). I thought Daddio was asleep, but apparently he was anxious too. At least our two travel companions were sleeping peacefully; the whole train car could be grateful for that. The sun rose before 5am, and so did the twins. (There are no curtains on the train.) They both claimed to be hungry, so we had a very early breakfast. We looked at some books. We played with our Star Wars action figures. And eventually, we went back to sleep. We crossed the border around 8am and we were all still groggy. In fact, Twin V was still asleep. And Twin S did not have any pants on. (Sorry, border guards. We respect your authority, we really do.) Crossing the land border was a slow process, involving two passport checks, lots of waiting around, and a constant barrage of “When are we going to be in Finland?” And then… we were in Finland! But we survived. We ate second breakfast; we ate third breakfast; we read; we sang; we colored; we drew; we stuck stickers; we climbed up to the top bunk; we climbed down to the bottom bunk; we ran up and down the train car, peaking into other compartments; then we did it all again. And then we finally arrived. Our friends (aka The Finns) met us at the train station, and we loaded up the car for the short ride home. And the twins promptly feel asleep in the backseat. All in all, the train journey went as smoothly as we could have hoped. It was about 25% cheaper than flying. It took about three times longer than flying (door to door). But it was definitely more fun than flying. I fear that we are ruined for the kiddie train.